Like most of us, 4th grader Tayler Henderson from Lyman Elementary watched the Japanese tsunami coverage on TV. But unlike most of us, she was moved to contribute directly to the victims. “I was listening to the news, and saw all the trouble, and I thought since we had [held a coin drive for] Haiti, we could do Japan,” said Tayler. She brought her idea of a coin drive to Principal Mark Nilson, talked through the logistics with him, then enlisted the willing aid of friends Brontë Stiles and Lily Millison and embarked on a mission to raise $200 for the cause. The girls made posters, bookmarks, and fliers to publicize the drive, and started getting donations before it began April 13. They hit their goal just three days into the drive, so they bumped the target to $300. On April 20 they had $370, so they raised it again, to $500. By their April 27 deadline, they’d collected $517.22. The money will be sent to the Red Cross for distribution to tsunami victims. “It’s a great idea, it’s really easy,” said Lily of the experience. The girls said they were grateful for the assistance they received from the school’s administrative secretary, Kristi Johnson. 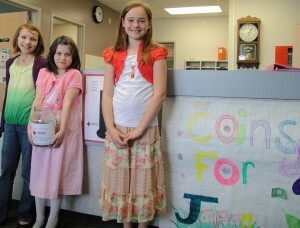 Lyman Elementary students (left to right) Brontë Stiles, Tayler Henderson, and Lily Millison started a coin drive April 13 to raise $500 for the Red Cross to help victims of the tsunami in Japan. By their deadline of April 27, they had raised $517.22.